The SXSW INTERACTIVE FESTIVAL brings together uber-geeks and digital innovators from around the world for four days of keynote speeches, trade shows, panels, parties and assorted evening fun. The 2005 SXSW Interactive Program of panels is targeted at both insiders and outsiders with the intent of attracting, informing and tantalizing potential attendees. As such it is the most public face of the conference. 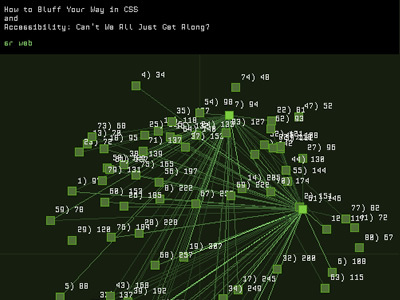 Ethan Miller has taken the text from this program and made obvious the conceptual connections between the presentations in a visualization build with Processing. Connections are extracted from vocabulary used in more than one description. Lines connect paragraphs with common words and the total number of connections is tallied. Each square represents a transcript from the SXSW conference. The brightness of the lines connecting boxes indicates the number of words shared ("noise words" are filtered out). 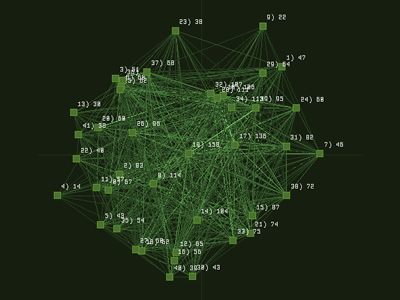 The distance to the center of the visualization indicated the total number of connections the text shares. The closer to the center, the more words the text shares with other texts. By default, all connections are displayed. Hovering on a box shows only the connections for that text, and the name of the text at the top of the screen. Clicking on a box selects it, so that one can hover over a second box. When hovering over a box while another box is selected, the connections for both texts will be shown, along with the titles, and the words they have in common at the top of the screen.